Discussion in 'World Editor Help' started by Romek, Feb 27, 2011. Simply post your submission in the Submissions Thread. 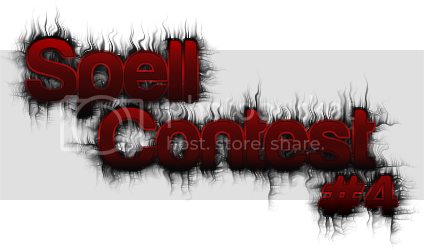 Your spell must be created solely for this contest. Imports are allowed (a change from last time). All systems and snippets are allowed (a change from last time). Your spell must be actively cast (no auras, passives or autocasts). The spell must be triggered. Using just the Object Editor is disallowed. GUI, JASS, vJASS and ZINC are allowed. All spells must be able to be opened in Newgen without any extra mods. No hybrid code. No converted GUI. Pseudo locals are allowed. The submitted map must be a demo map for the spell. Don't submit spellpacks or ORPGs with the submission in them. One submission per member; One member per submission. The grading will be done solely by me, using the following criteria. Note that each category includes, but isn't limited to the bullet-points underneath it. Is it MUI or MPI? Are the effects appropriate, or are random effects just played randomly? Does the spell go well with the theme? Does it amaze me when I use it? Reputation will be rewarded to the top three placed contestants. skyblader You're living only because it's illegal killing. Hmm.. What are the rewards? I might try to join this as well.. I knew I forgot something. Fixed that now. KaerfNomekop Swim, fishies. Swim through the veil of steel. Is using magic with a physical strike allowed? For example, skills like Fire Punch. And what does "No hybrid code. No converted GUI. Pseudo locals are allowed" mean? Umm we are just creating one spell right ? Also, about coding.If a spell coded with normal jass(hashtables - timer things) will it lose point from efficiency? > Is using magic with a physical strike allowed? For example, skills like Fire Punch. If the appearance of the fire can be explained without using magic, then yes. Otherwise, no. > And what does "No hybrid code. No converted GUI. Pseudo locals are allowed" mean? Nothing like this. No making the spell in GUI, then converting it to JASS (because converted code is horrible), and using locals in GUI though the use of custom scripts is allowed. > Umm we are just creating one spell right ? > Also, about coding.If a spell coded with normal jass(hashtables - timer things) will it lose point from efficiency? What is normal JASS, and how is it different from abnormal JASS? I won't penalize you for what method of attachment you decide to use. Hashtables, T32, TimerUtils (amongst others) are all fine. If the implementation or usage of those systems could be better though, points will be deducted. are we allowed to have only 1 spell, but with different effects/phases that depends on the player? I've just finished my submission, will be adding some final explanations to the triggers and upload it. i got a very interesting concept. one question though to the rule that there should be no object editor data used, effects like stun, attack speed bonuses, all that kinds of stuff are allowed to be used by dummy units or similar things right? or are we limited to make everything based on a channel type ability combined with triggers? EDIT: Also, what if a submission requires a system? Like I made a souls system, and what if a spell I made required that? It's a spell, based on a system. I just wasted 6 hours of my life ..
> are we allowed to have only 1 spell, but with different effects/phases that depends on the player? Yes. If a 'random effect' or something similar is part of the spell, then it's fine. > one question though to the rule that there should be no object editor data used, effects like stun, attack speed bonuses, all that kinds of stuff are allowed to be used by dummy units or similar things right? I think you're misunderstanding the rule. It's simply there to ensure that nobody enters with a spell that isn't triggered. Using the object editor is fine, as long as you also use triggers. > and a skill does count as a "physical" skill as long as we make some background story behind it labeling it as physical? Yes. Blink because the caster transforms into lightning and zaps his way around isn't allowed. Blink because the caster overdoses on red bull and moves faster than the eye can see is allowed. > Also, what if a submission requires a system? Like I made a souls system, and what if a spell I made required that? It's a spell, based on a system. All systems are allowed. Why would this be a problem? At least you know how not to do the spell, and have a general idea of how each component of it should be coded. Try giving that spell another try, from scratch. You'll find that you'll end up with a much better result. D'oh, physical. At least, now I know that the theme is broader than "punching". Basically anything that doesn't involve common magic (fire, lightning, nature, etc) is allowed. But a flamethrower, a tesla coil, or a pseudo-supernatural skill like "summons a bear because the caster knows how to communicate with bears" is OK, right? What about supernatural technology like force fields and defensive shields and energy beams, or unreal physics like alchemy, or impossibly fast-growing seeds that turn into entangling roots or treants? I'd like clarification. The spirit of this is to not submit a premade spell, or one intended for a concurrent contest, right? What if the spell is intended to be used in a project but not yet made and fits the theme? > But a flamethrower, a tesla coil, or a pseudo-supernatural skill like "summons a bear because the caster knows how to communicate with bears" is OK, right? > What about supernatural technology like force fields and defensive shields and energy beams, or unreal physics like alchemy, or impossibly fast-growing seeds that turn into entangling roots or treants? > I'd like clarification. The spirit of this is to not submit a premade spell, or one intended for a concurrent contest, right? What if the spell is intended to be used in a project but not yet made and fits the theme? Yes. You're free to use your spell after this contest in whatever way you wish; I don't need to know what your plans for the future are. Then, I'm befuddled. I guess all I can do is limit my scope further (gotta discard that one idea I had) and hope for the best, because that doesn't make sense to me. why would a flamethrower or the communication with bears be magical? or at least not physical? and do we get some kind of confirmation whether our submission fits the rules / theme or not? i am curious whether my skill is counted as physical now. A. I'd like to ask something, A dragon has the ability to breathe fire, it's physical right, since the dragon only uses his own body to produce the flames, right? B. How about a footman using his weapon to burn his enemies, like a flamethrower? Is that considered physical even if the weapon isn't part of his body? If my question A is right, then I'd go with the definition that all physical abilites must be producable using one's own biological faculties. If that's true, could someone make the argument that a spellcaster uses his own psychic/biological faculties to cast magic spells? Then a dragon could be considered a "magical" creature. But I guess the footman using a flamethrower shouldn't be magical, though. GFreak45 I didnt slap you, i high 5'd your face.